I can type about 120 words a minute in English using a laptop but i'm not so sure about my Thai skills it's probably only about 20-30 words a minute if I'm thinking about what to write. If I'm copying Thai and it's not that difficult a text it's probably a lot faster. The way I learned to touch Type in Thai is pretty simple first I used this website I'll show you in a minute that helps me to feel the keys on the keyboard and then I practiced by talking to Thai people on MSN messenger. After about 3 months of a few hours a day chatting to people on MSN you can start to get to know the Internet slang and ways to sound more "Thai" online. These days it's not uncommon for me to get on MSN and pretend to be a guy a girl a lesbian or Tom and let people believe i'm really Thai. I just do it for fun and to practice my Thai. Sure beats reading a book! So if you don't already know how to read Thai but can speak it I recommend you get the book Learn the Thai alphabet this will enable you to read the alphabet within a day or two then start trying to read texts and practice typing. I don't recommend you actually try writing Thai at all because it's basically useless unless you want to write a love letter! To learn how to touch Type in thai (or maybe your girlfriend wants to type in English) then I suggest you go to the following website which I used to learn to Touch Type in Thai. There are two sections for learning to Type for English and Thai. 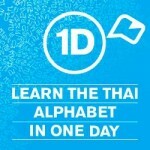 The Thai lessons are really good and strengthen how you can Type and find the keys. 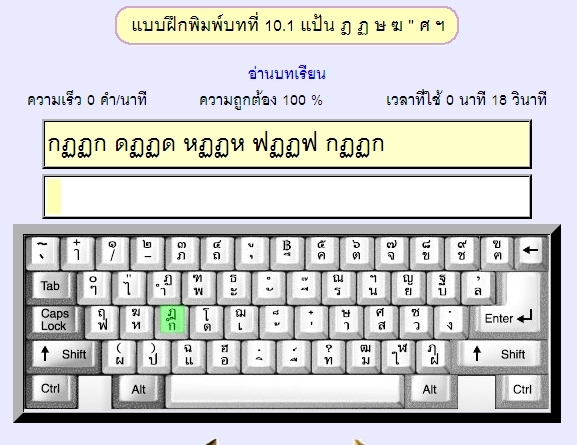 It's a free touch typing tool to learn to type in Thai. Once you are confident and can read the lessens then you need to find some Thai people to chat too. I don't recommend going to a Thai dating site to find these people because most of them can speak and type in English. You need someone who can't even speak a word of English. These people can be found on Postjung. How Facebook could make some real money! One thing that really helped me as well was drawing the keyboard from memory on to a blank piece of paper, everyday after doing typing lessons. 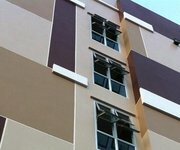 Thanks for the link, been looking for something like this. I read somewhere that the average person touchtyping in Thai is waaaay slower than English, I recall it was around 30 wpm so you’re not too far behind. I know this post is from last year but I want to add that as a native Thai, I still type faster in English. Given that I just googled how to touch type in Thai and found your website instead of a Thai page, I think you can safely say that most Thai people cannot touch type in Thai either. We have so many letters in the alphabet. It’s not very pleasant when you have to do a five-page report. I can finish the same job in English half the time I need to do in Thai. Actually I don’t believe there are that many more characters in Thai than in English espeically just chatting online with your friends i can type equally as fast in English as I can Thai about the same thing. There are about 60 characters I use in English upper and lower case plus puctuation. some things are just shorter to write in Thai as in English, it’s pretty even but that’s just my opinion and expereience. We recently released a website (thaityping.com) to help Thai students to practice the keyboard. This first release is not oriented to learn Thai for non-native but to remember keys location on the keyboard through muscle memory. Given your experience, any advise from you is welcome! great site I just posted it on my Facebook and will recommend it to others thanks. I think you’re absolutely right that it is much easier to learn to type in Thai than to write in Thai. And who writes anything by hand these days anyway? We have setup http://www.learnthaiping.com. It is a bit different to the above mentioned website because it focusses more on using typing as a tool to learn Thai rather than focussing on improving typing speed. So shorter practice phrases, English translations and the user interface of the site is all in English. It also has word-by-word audio and word-by-word highlighting. The highlighting particularly helps those just starting to read Thai, when the lack of spaces between words can be a bit of a barrier. I have certainly found that if you can already touchtype in English, it isn’t that hard to transfer those skills to touchtyping in Thai too.